This ambrosia salad recipe makes a delicious holiday fruit salad, and it's super easy to prepare. 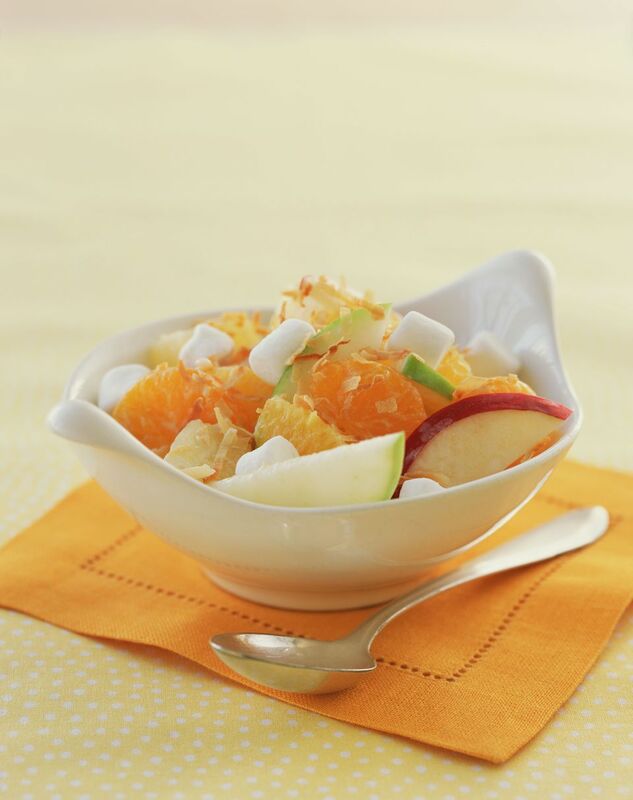 Miniature marshmallows and coconut give the fruit salad some fabulous texture. You can also add pecan or walnut pieces if you'd like for a little nutty crunch. Serve the salad in bowls, on lettuce leaves, or on a bed of mixed greens for a lovely presentation. The contrast of the fruit-studded creamy salad on greens is festive. Ambrosia was the food of the Greek gods, granting them immortality. Naming this salad ambrosia is an appropriate sentiment for one often served at the year-end holidays such as Christmas parties. Pineapple is also a symbol of hospitality, another appropriate sentiment for parties and gatherings. But the salad seems to come from the late 19th century. Canned fruit is a convenience during the winter when fresh fruit would not have been readily available. Fresh mandarin oranges are now readily available in the winter months, or you can use canned ones, which have the advantage of being peeled. Drain all of the fruits thoroughly. Combine the drained fruits, marshmallows, sour cream, and coconut, mixing gently but thoroughly. Cover and refrigerate the fruit salad until thoroughly chilled. Serve the salad on lettuce leaves or mixed greens. If you are serving a crowd or taking a bowl of ambrosia salad to a potluck, you might instead arrange fruit on top to make a design and skip the lettuce. Sour cream adds a tart element to ambrosia salad, but if you prefer, you might use plain Greek yogurt or regular yogurt. For a sweeter variation, you could use a sweetened yogurt or whipped cream. However, whipped cream doesn't hold up as long and so you should only consider it when serving the salad immediately. You can get creative with ambrosia salad and include or omit many types of fruit and nuts to suit your taste or food sensitivities. The key is keeping the fruit bites about the same size so they mix well.